This my collected whitethorn.i have the tree a few years and i recently potted it up.it has been cut back in the winter and is now showing signs of life. This is my newly collected crab apple.it was growing on a wall and is pretty old.i have the base covered in moss.it is rooted in two places.it should make a nice raft in time. A long way to go ! This my japanese white pine.i have the tree about two years and in that time i have rewired the tree and potted it up into a ian baillie pot from scotland.before me the tree was owned by the late sharon green.she was a wonderful bonsai artist and had some amazing trees.i had a few issues with wood rot on the lower grafted black part but sorted now thanks to wood hardener.here is a few pics.any comments or ideas i would be grateful. If you are out on the West coast of Ireland and feeling isolated from all things bonsai, then maybe it’s worth making a trip to Bud Garden Centre in Bunratty. 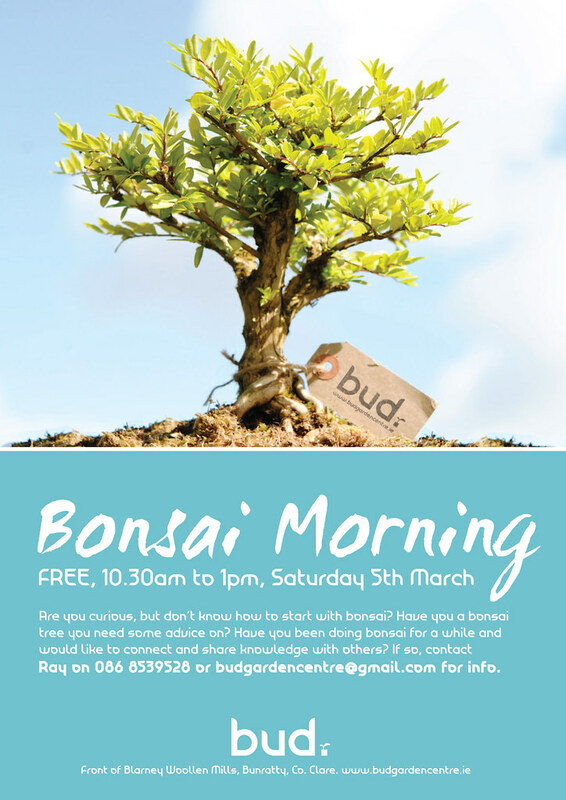 Ray, a member of Munster Bonsai Club is starting up regular sessions at the garden centre in an effort to promote bonsai and give a focal point for bonsai in the west. If you read this and are interested, please give him a shout via the number or email listed on the flyer below. Well done Ray for pushing on with bonsai in the West. This is a juniper i got on holidays when i o was in portugal about a year and a half ago.i googled bonsai nurseries while i was there and it came up with jardim de bonsai which was run by rui ferreira.it took me two taxies and a bus to get there but it was worth it.rui was having a 50% sale so i couldnt resist.i bought this juniper and a trident maple.i emptied out my suitcase and brought the trees home with me. i had to dewire and add new copper wire,also a new jin was added.